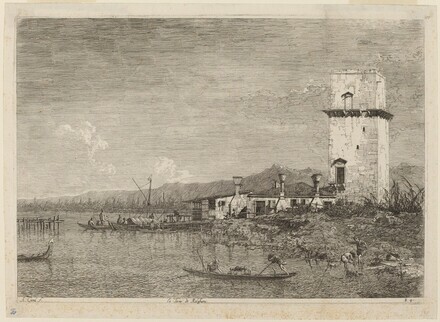 lower left in plate: A. Canal f.; lower center in plate: la Torre di Malghera; lower right in plate: E4. Bromberg, Ruth. Canaletto's etchings: a catalogue and study illustrating and describing the known states, including those hitherto unrecorded. London: Sotheby Parke Bernet, 1974, no. 2, iii/iii. Bromberg, Ruth. Canaletto's etchings: revised and enlarged edition of the catalogue raisonné. San Francisco: Alan Wofsy Fine Arts, 1993, no. 2, iii/iii.